JY is an imprint of Yen Press that caters to middle grade readers. JY was founded as an imprint of Yen Press in the fall of 2017. 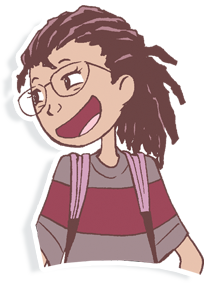 Named for JuYoun Lee, Editor in Chief, the JY list features the acclaimed AWKWARD and BRAVE graphic novels by Svetlana Chmakova, as well as W.I.T.C.H., a teen-girl focused series originally produced by Disney Publishing and Digital Media in the mid-2000s. How is JY different from Yen Press? While Yen Press continues to publish across all age categories, JY is specifically targeted to middle grade readers (ages eight to fourteen). Whether you’re a librarian, parent, or guardian looking for a graphic novel for your child, you can rest assured that JY graphic novels are age appropriate and a great way to encourage reading! What is JY’s mission statement? The JY line is dedicated to developing books that target a younger audience. We strive to develop new talent and aim to become a long-term publishing home for artists across the globe. How do I buy JY books? If I have a question, how may I contact JY? What age category is JY appropriate for? JY’s intended audience is for the middle grade readers category. However, JY graphic novels can be enjoyed at any age, including teens and adults! Where can I get updates from JY? For the most up-to-date information regarding JY and its titles, please follow us on Facebook, Twitter, and Instagram.